A ghostly gateway stands in the middle of "Luminous," the big and beautiful Asian art exhibition that opened this week at the Seattle Art Museum. The fabric structure, by the esteemed contemporary artist Do Ho Suh, is modeled after a traditional gate from Suh's childhood home in Korea and is attached to a large silk scrim, allowing the whole piece to become a screen on which images of art, tradition, memory and the past are projected. In one sequence, Suh re-creates the crows from SAM's well-loved 17th-century Japanese "Crow Screen" (which is on display nearby) and animates them, sending them swooping across this 21st-century screen. In a frenzy of group flight, the crows seem to disappear through the gateway. The installation is an evocative metaphor for this bold exhibition, which examines the visual beauty and fluid past of 160 works of art in SAM's Asian art collection. Rather than taking a chronological or geographic approach, Japanese art historian Catherine Roche, the show's curator, decided to emphasize "the journeys that these objects have taken, the shifts of meaning from one context to another, one generation to another." Rather than attempting to place these works of art in a semblance of their original contexts, the exhibition acknowledges the fragmented quality of panels taken from temples or Buddha heads separated from bodies. We are invited to revel in the beauty of these pieces as works of art. It's a tricky endeavor, trying to highlight objecthood and aesthetics while also highlighting connections of tradition, ritual, or motif across geographic and temporal thresholds. And there are times that I wished that the object labels offered more information that supported the boundary-crossing nature of the objects, helping us recognize symbols or themes from work to work. The exhibition does show off some new scholarship and fascinating conservation efforts, and its subtle, nonlinear arrangement should appeal to experts and aficionados. And yet the big revelation of this show isn't at all new: The museum holds one of the finest collections of Asian art in North America, a collection that is admired internationally. Gallery after gallery contains highlights of the museum's holdings: The Chinese "cong," which dates from 2800-1900 BCE, is one of the oldest Asian objects in the collection. The lyrical 17th-century Japanese "Poem Scroll with Deer," considered by Roche to be "the masterpiece of the collection" (and to which Do Ho Suh also refers in his "Gate" installation), is unfurled to show a majority of its 30-foot length. And there are plentiful, high-quality examples of ceramics; textiles; lacquer and metal ware; sculptures in bronze and stone — works that have been culled from thirteen countries and divergent, but often overlapping, religious traditions. Scattered throughout the exhibition are aptly chosen contemporary pieces that reinforce the themes of displacement, cross-influence, and the relationship between past and present. The stunning, milky-white "Moon Jar" made by Park Young-sook in 2007 is the result of the artist's efforts to master a uniquely Korean form of 18th-century porcelain. 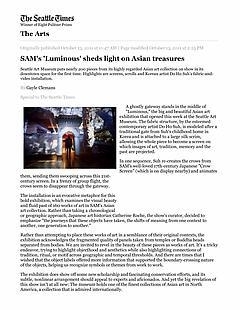 Many of the works have come out of storage and, rather than filling up the intimate spaces of the Seattle Asian Art Museum in Volunteer Park, they temporarily occupy the "special exhibitions" galleries of SAM Downtown, where touring blockbuster shows usually set up camp. This could be perceived as a new coat of paint for an old car, and it's certainly a practical solution to filling the schedule without shelling out for big-name packages like the Picasso exhibition last year and the upcoming Gauguin show, but I love the idea of a special exhibition that pulls out all the stops and really celebrates the strengths of the home institution's collection. This is a show that invites a fresh look at, and a more flexible understanding of, the luminous Asian art that has traveled across continents and through eras to reside in the here and now.